If you’re a savvy business owner, you understand the importance of having a reliable web host. A good hosting company can not only keep your site safe from hackers and provide a quality service that ensures your site is up even during the most critical times, it can also save you time. When it comes to hosting companies, there is no shortage of providers. Some of them offer a variety of different plans and some of them offer highly specialized services like WordPress managed hosting. One such company is Kinsta. Although a relatively young company, it’s already making strides in the managed WordPress hosting arena. In this review, we’ll take a look at what makes it different from others and the powerful features it has to offer. Kinsta was founded in 2013 by WordPress developer, Mark Gavalda. The company developed out of the need to provide a reliable and affordable hosting company to business owners who want to focus on running their business instead of worrying about maintaining their site. They work with some of the biggest brands such as Mint, GE, Intuit, and AdEspresso and serve their clients from three locations in Los Angeles, London, and Budapest. Furthermore, their support team is made up of WordPress developers so you can rest assured your website will be in good hands. 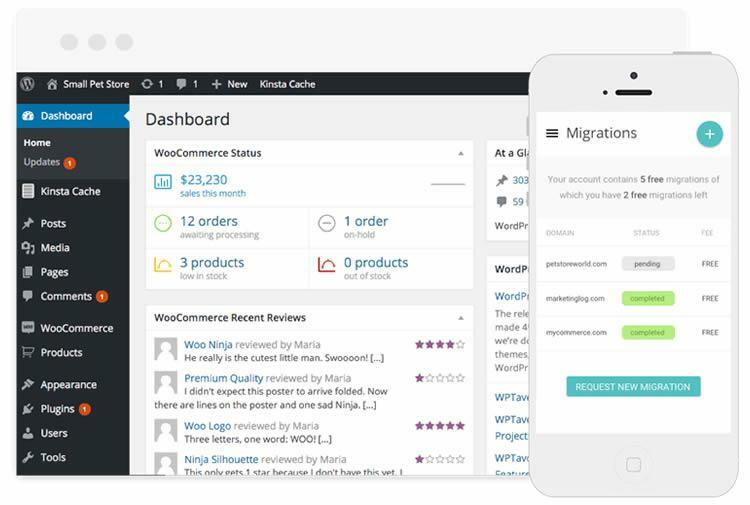 Kinsta offers managed WordPress hosting with some interesting features that makes the company stand out among the competition. The first is the fact that the company uses Google Cloud Platform, which allows them to take advantage of Google’s private Fiber network. The network in question features a distributed backbone between all data centers, which makes it possible for Kinsta’s servers to process more data in a lot less time. You can also choose between several different physical server locations, allowing you to serve your site from a server that’s close to your customers and clients. All of this combined has a huge benefit on the loading times of your website as it decreases latency. Secondly, all of Kinsta’s plans offer unlimited pageviews, unlimited visitors, and very generous bandwidth caps. If that’s not enough, your site will be monitored every minute – 1440 times a day – for downtime and you’ll also get the benefit of daily backups and a free SSL certificate. In terms of security, Kinsta implements both active and passive measures that protect your site from malicious attacks. Aside from the aforementioned uptime monitoring, they have DDOS detection, hardware firewalls and software restrictions, and continuous malware scanning in the background. 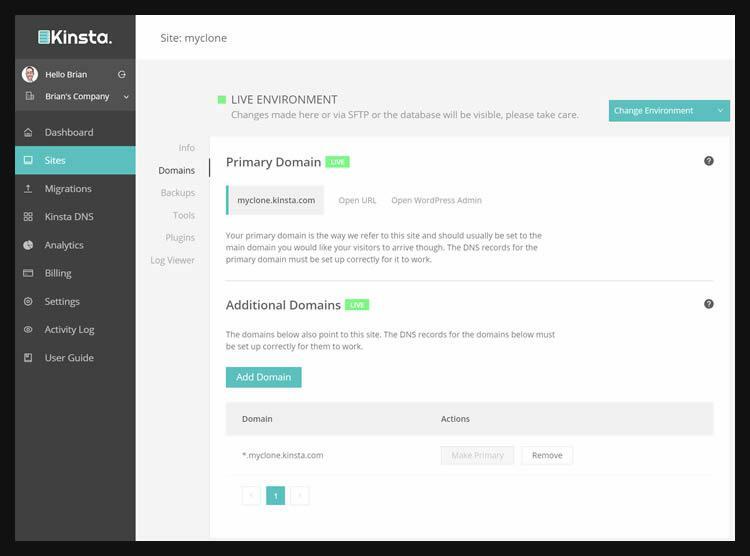 It’s worth mentioning that you can migrate your site to Kinsta for free with the help of their support team and in the event the worst happens, the company will fix your site for free. Kinsta offers eight plans divided into two tiers as well as custom pricing. Business plans range in price from $100-$400 and include unlimited visitors, pageviews, staging areas, free SSL certificate, multisite support, the ability to use your own CDN, automatic daily backups, and continuous uptime monitoring. The plans differ in the amount of disk space, allocated bandwidth and the number of WordPress sites you can install. Enterprise plans start at $600 and go up to $1500 which offer the same features as the business plans but offer considerably more in terms of disk space, bandwidth, and the number of sites. The enterprise plans are geared towards large and high-volume sites. It’s worth mentioning that all plans can be paid on a monthly or a yearly basis. Since Kinsta offers managed WordPress hosting, they offer features that cater to developers. As a WordPress developer, you know you need a reliable way to test new tweaks and options. While you can always run a local installation, having the ability to create a version of your live site allows you to test different environments and find the one that provides the best experience. 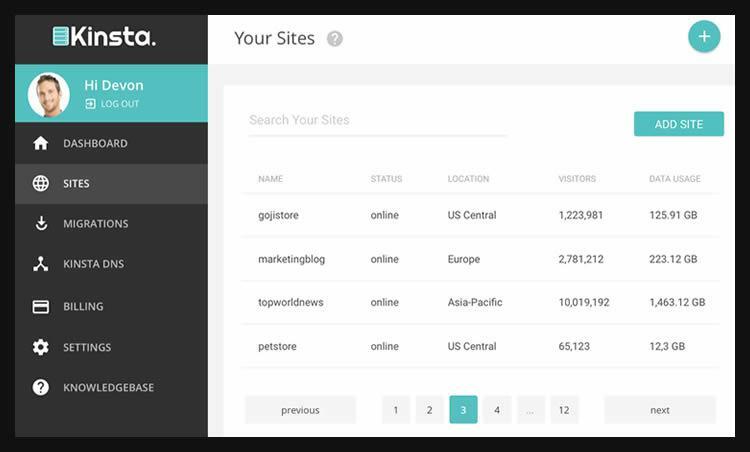 You can also use it to test new themes and plugins without affecting your site and ensuring nothing goes awry once you install them on your live site. 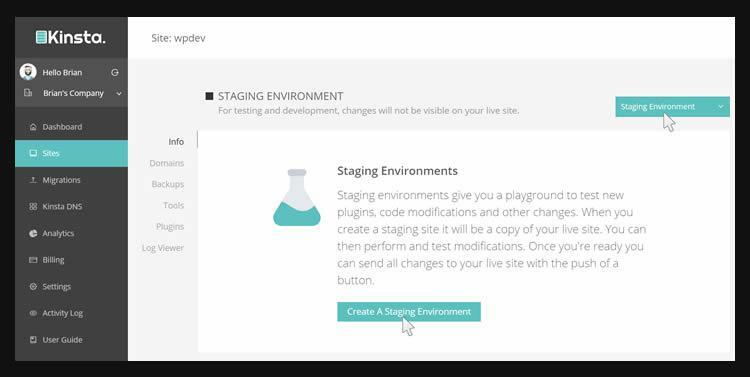 Kinsta also allows you to clone any of your live or staged sites so you can develop a custom theme for your client. Anything that can speed your workflow is a positive thing and with Kinsta, you can do just that. Kinsta’s service uses LXD container technology that allows each site to “live” in its own virtual server. The benefit of this approach is that your site is protected in the event one of the sites on the same server gets compromised. It also makes backups easier. Lastly, when it comes to programming features, Kinsta plans come with PHP 7 which helps your site use less resources. However, you can easily switch to PHP 5.6, 7.1 or HHVM should you need to. You’ll be able to use WP-CLI, Composer, and Git out of the box and you can use SSH to access those tools so you can speed up your workflow. When it comes to databases, you can manipulate them with HeidiSQL or Sequel Pro. For a young company, Kinsta offers a lot of bang for your buck. While their hosting plans are more expensive than those offered by similar companies, keep in mind that Kinsta aims to provide top-notch service without sacrificing quality or the ability to deliver on their promise. That said, it’s worth mentioning that you cannot host your email or register a domain through Kinsta so you’ll have to find different providers for those specific services. Kinsta is a great choice for growing businesses as well as high volume enterprises that need a reliable service and want the technical details of website maintenance handled by someone else. If you’re convinced Kinsta‘s plans are a sound investment, we have a special discount for our readers. If you sign up at any time during the next 30 days, just mention Speckyboy, and you can get 50% off your first month’s bill so give it a try.